I’ve been writing a staff newsletter for KidsOutAndAbout.com, and recently I was laughing about how my publisher, Deb has spent the morning “exploring a corn maze and fondling a goat on tv. Because that is her job.” Because, you guys, that’s a pretty fun job. 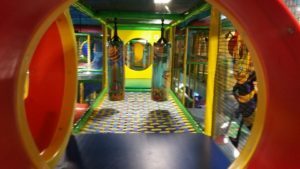 The other day, it was very important to my job that I slide down some slides and eat some pizza at Billy Beez at Crossgates Mall. Because, you guys? Fun is, like, my business. 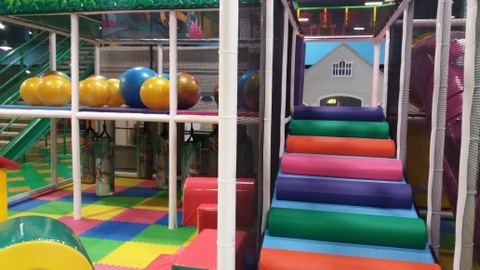 Billy Beez is an indoor play center that has tons of maze-like climbing structures, slides, a ballistics area, trampolines, an arcade game area, and a very adorable preschool pretend area called Honeycomb Village. I tried to take some pictures in Honeycomb Village, but there were a couple of toddlers who were completely and utterly committed to their pretend busy lives as veterinarians and mommies and pizza makers, and I couldn’t get any pictures without looking like a creepy stalker. So instead I wandered around the play areas waiting for them to clear out so I could take pictures. It really was all bright and colorful and clean-looking. 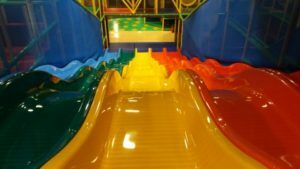 Their claim to fame is slides, and they even worked it into the design of the place, because it’s where the old movie theaters used to be, complete with sloping floor, with the entrance on the 3rd floor above Best Buy. My favorite slide wasn’t this one, but the “drop slide” that actually felt a teensy bit scary before I went down it, because it looks like a big, bright, plastic cliff. But I’m a professional, so I did it. Apparently the big kids are crazy about the ballistics area. Personally, I do not love it when people shoot things at me, but, you know, to each their own. They’ve also got some trampolines that are completely walled off from each other, so if you are one of those parents who goes to a bigger trampoline park, and then you’re completely freaking out because all of those damn big kids keep jumping around close to your small, delicate little dumpling, and probably, probably, someone’s going to break something any minute. . . well, then, this provides a bit of serenity. Although upon reflection, it appears that perhaps that particular serenity is sold separately. 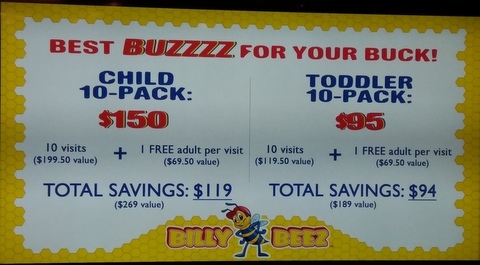 And I took a picture of this, because if you have little kids and Crossgates is near you, you are likely to be a repeat customer, and it really is much cheaper. I checked, and you can use you 10-pack for more than one kid. So, say you have two kids, you’d be able to take your two kids together, five times. 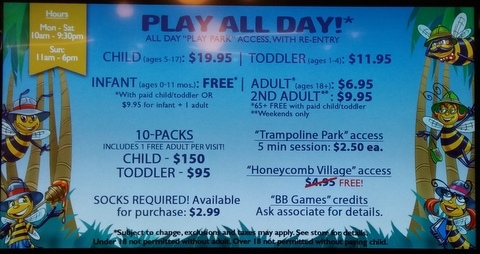 Except that of course your toddler can go in with a “child” admission, but your “child” can’t go in with a “toddler” admission, and if you were on your own you’d be missing out on that spare adult admission, but still a better deal. You can also go in and out throughout the day, so you could potentially shop for a while with the Billy Beez visit as a reward for good behavior, and then you could let your kids exhaust themselves and fall asleep in a stroller and keep shopping. I say “you could” but I mean that as in “one could potentially shop. . . .” Because, myself, I would probably start feeling twitchy. I start to get “mall sick,” as you know, which is sort of an anxious/phobic reaction to over-stimulation and excessive cologne fumes and idealized mannequin bodies at war with giant soft pretzel displays. But I just think the shopping-or-movies combo make this awesome for making one spectacularly fun rainy day or an outing with the grandparents. My kids are aging out of this zone, but it’s definitely worth a visit. If you’ve got kids under ten, this would likely be their new favorite place, and it seems to me that a 10-pack would be a terrific idea to put on the Christmas list. Super-useful review! I totally understand what this place is about, now. I will definitely take my almost-9 year old there. I had never heard of it before, probably because I avoid Crossgates like the plague. I love that there isn’t a computer screen or tv in site. Or did you just avoid them? Looks super fun! I think they had a tv with a game on for bored parents maybe, but it was pretty non-screeny.